I try to meditate regularly, but I am not very good at it. Once I sit, I am fine, but actually getting myself to set aside some precious time to be still is a struggle. I have found that sitting with a group can be very helpful, so when a friend of mine invited me to a local sitting group called Against the Stream, I decided it was a great opportunity to explore one more resource in my quest to learn how to quiet my endlessly chattering mind. I arrived at the meditation center a little frazzled from heavy crosstown traffic and my personal disdain for arriving anywhere even a few minutes later than planned. The room was moderately full and everyone seemed to be settled into their seats and ready to begin, so, as soon as I saw my friend, I sat down in the chair he had saved for me and tried to let the tide of frenetic energy subside from my shoulders, chest, and arms. I looked up to the front of the room where the teacher sat, ready to guide us into a state of unattached awareness, and was instantly struck by a series of luminous pieces of art on the wall behind her. 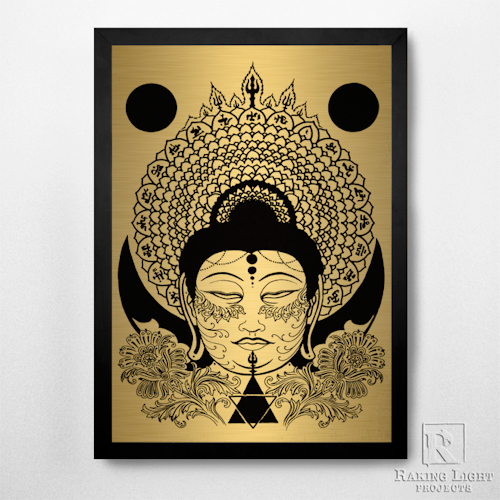 I tried to focus on what the teacher was saying, by I couldn’t take my eyes off of the gold plaques with their intricately etched black images. 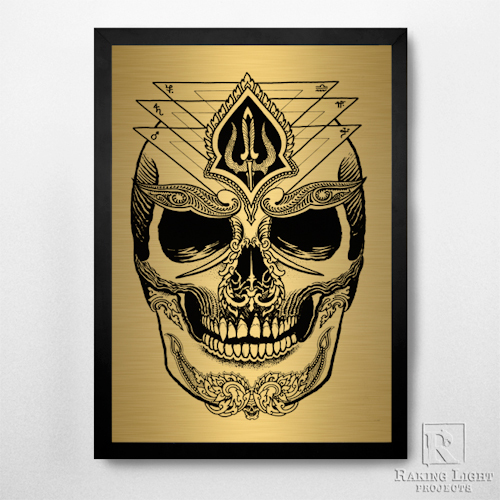 Skulls, mythological creatures, and Buddhist imagery held a dark and mysterious allure as the sheen of the light reflecting off of the brushed gold background made the pieces almost impossible to look away from. Throughout the entire meditation, I was delightfully tormented by flashes of the imagery and struggled to resist the urge to let go of my practice and open my eyes to take another look. The smiling skull from a piece called “Lexistir” and the four-armed, winged, god-like being of “Medtopia” danced across the backs of my closed eyelids, and as soon as the meditation ended, I walked over to the wall and stood directly beneath the pieces to take them in more thoroughly. I found a flyer on a table nearby that informed me that these pieces were part of a series titled “Aeons-Tulpa” and were created by an artist named Jondix Mahashakti, who is a designer and fine artist, but is best-known for his beautiful and ornate, Eastern-inspired tattoos. If you search for information on Jondix online, you will find a multitude of tattoo images, but very little in the way of personal information. 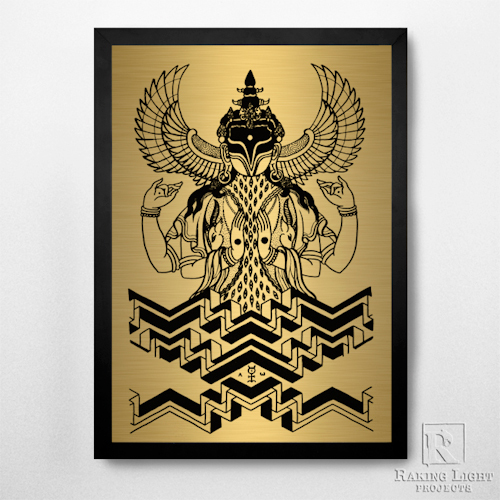 The bio on his site, www.holytrauma.com, indicates that he has worked as a tattoo artist all over the world and learned many of his drawing techniques in Thailand and India, but other than that, he remains as mysterious as the mythological beings that have been laser-etched onto their golden substrates in his striking works of art. It was that particular enigmatic quality that led me to stand, enchanted by the pieces, for several more minutes before pulling myself away to continue on with my evening. As I drove back across town and made my way to my home and eventually into my bed, my mind kept returning to the captivating images of Aeons-Tulpa.